The overwhelming reason to see the COC’s latest production of Rigoletto is the absolutely sensational performance of American soprano Laura Claycomb as Gilda. Gilda is the innocent daughter of Rigoletto (Alan Opie), hunchbacked jester and pander to the lascivious Duke of Mantua (Giuseppe Gipali). 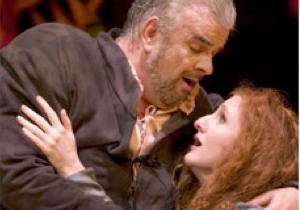 Though Rigoletto tries to shield her from the corrupt court, inevitably the Duke seeks her out as his next conquest. Claycomb is totally absorbed in her character and makes the role’s stratospheric vocal demands seem like the completely natural outpouring of a young woman’s emotions. Her sublime performance of “Caro nome” in Act 1 is alone worth the price of admission. Despite respiratory illness, Opie sings well and gives a complex portrait of a man struggling inextricably in a web of deceit. Gipali sings with enormous power but little subtlety. Michael Yeargan’s abstract set annoyingly favours only those seated house right. Young Canadian director Adrian Osmond’s pedestrian direction contrasts greatly with the rippling excitement conductor Julian Kovatchev draws from the COC orchestra. Note: A version of this review appeared in Eye Weekly 2004-04-15. Photo: Alan Opie and Laura Claycomb. ©2004 Michael Cooper.